Have you decided that it’s time to tackle home renovations and even construction in your home? A remodel can be a very exciting time that can help you transform the space into your dream home. However, along with the excitement comes a whole lot of mess. Even when you try your best to be neat and tidy, accidents, spills, and just general dust and debris are the norm. 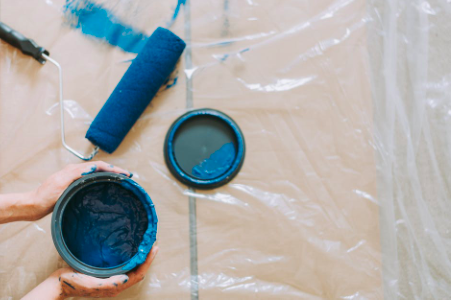 With that said, there are a number of key steps you can take that will help protect your home during the process and ensure everything looks as good as new when you’re done. Here are the key tips and steps you can use. If you plan on doing any painting at all during your construction project, then dropcloths are the absolute best thing to have on hand. Dropcloths are meant to be put on the floor while you paint so that any spills or splatter ends up on the cloth and not your flooring. They are typically made of a canvas material, which is thick enough to absorb those spills. You may even want to look into the models that stay put, and won’t slip around. These are handy near doors and especially on stairs. If the dropcloth is shifting around then you risk soiling the flooring, but it can also be a safety hazard since you can slip and fall. For more extreme construction projects where a construction crew may be in and out of your home, look for a heavy weight dropcloth with a leak-resistant backing. You will also want to be sure that all your furniture is covered. It doesn’t matter if there is paint involved or not as dust and debris can still soil the furniture. Depending on the rooms you are working in and the work you are doing, all the furniture may need to be moved to a different room, a corner of the room, or even the center of it. Once in place, then you can cover everything up. Another tip is to either take down your window treatments – blinds and curtains – or wrap them in plastic. Most people prefer to wrap them as it’s much less time-consuming and then you don’t risk losing parts and pieces. Many homeowners also see the benefit in creating a path if you will. This is a path made of drop cloths or old carpet scraps that you can stay on when you come in and out of the house with materials. This helps to keep the mess to a specified area. Each and every day of the construction project will result in mess, so rather than let it build up, it’s a good idea to do a cleaning at the end of each work day. The good news is that there are plenty of ways you can protect your home during a construction process, making sure things stay as neat and tidy as possible.